Women's Americana Boxers & PJ Pants Only $5.99 + FREE Shipping! You are here: Home / Great Deals / Women’s Americana Boxers & PJ Pants Only $5.99 + FREE Shipping! Women’s Americana Boxers & PJ Pants Only $5.99 + FREE Shipping! These are just too cute! 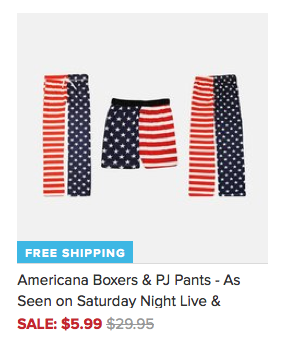 Show your pride in these Women’s Americana Boxers & PJ Pants for only $5.99 + FREE Shipping! They also have them available for men, too! Grab yours now before they are gone!